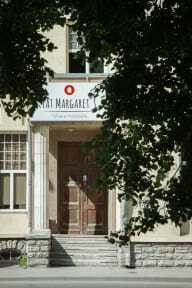 Friendly Fat Margaret's hostel can be found in the very centre of Tallinn. It is located just at the gate of Tallinn's medieval old town - a minute's walk away from the busy port of Tallinn. Fat Margaret's is a perfect place to stay for ones keen on exploring the Historical Tallinn with its narrow streets and picturesque red roof-tops - not mentioning the cafes, bars, nightclubs and restaurants. The hostel offers for it's guests simple but comfy rooms, helpful staff and easy-on-the pocket prices, which make the place perfectly suitable for travellers of all ages. 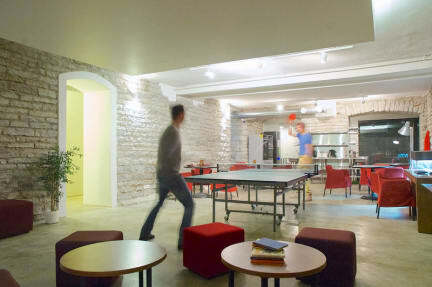 Hostel offers a possibility for a free morning sauna and pool. Ein sehr angenehmes sauberes Hostel. Das Hostel liegt nur wenige Gehminuten von der Altstadt entfernt. Die Ausstattung in dem 4er Zimmer war völlig ausreichend, die Betten waren sehr bequem und das Zimmer sauber. Die große Gemeinschaftsküche ist ein schöner Pluspunkt gewesen. Absoluter Höhepunkt ist jedoch die eigene Sauna mit Whirlpool. Uns hat der Aufenthalt sehr gut gefallen, das Zimmer war sehr sauber und das Personal ebenfalls sehr freundlich und kommunikativ. Der Zustand unseres Zimmers war sehr neu und geräumig. Besonders gut hat uns der Aufenthaltsraum mit Küche, Tischtennisplatte, Playstation usw. im Keller gefallen. Direkt daneben befand sich die Sauna und der Pool, welche ebenfalls genutzt werden konnten. Daneben standen ebenfalls weitere Duschmöglichkeiten zur Verfügung. Einen Fön konnte man sich kostenlos ausleihen. Ein sehr angenehmes und zentrumsnahes Hostel. Durch de Lage an der Hauptstraße nachts leider etwas laut, aber sonst absolut zweckmäßig. Für einen Kurztrip angenehm und zentral gelegen. Das Personal sehr hilfreich und freundlich. Zimmer sehr klein, aber sehr sauber. Mitarbeiter kompetent und freundlich. Super Lage, gute Erreichbarkeit. Nice hostel, the rooms were clean and spacious. Only the bathrooms on the upper floor were really dirty.. But overall a good place to stay in Tallinn! I went there for the free sauna in the morning. The location is not the prettiest one, but the hostel is very well situated at the edge of old town right between seaport and station. A tram station and one of the town gates is just across the street. The staff during day time was very nice, the one in the night seemed annoyed. Only one shower on the first floor, to the others in the basement you needt to walk through the common room. The atmosphere among travellers was strange, high average age. Every time you would leave the hostel you have to leave your room and locker key at the reception! How can you call that safety? Sometimes they did not know weather you just leave your jet or check out. I was scared I would come back and my stuff is gone! Also on the first floor if you want to take a shower you'd have to walk through the kitchen and common area. That was quite embarrassing sometimes. The location is nice and the rooms and facilities are clean though!